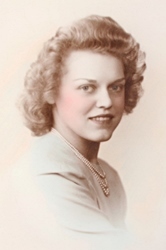 Lucille C. Wierenga, aged 93, went to be with her Lord on Wednesday, February 6, 2019. Lucille enjoyed spending time with her family and really enjoyed reading Christian fiction books. She was preceded in death by her husband, Henry; brother and sister-in-law, Arthur (June) Thomasma; and sister and brother-in-law, Evelyn (Claude) Nanninga. She will be lovingly remembered by her children, Gary (Linda) Wierenga, Tom (Karen) Wierenga, Bruce (Robin) Wierenga; grandchildren, Kim (Matt) Sutka, Marcy (Brad) Phillips, Marcus Wierenga, Micah Wierenga, Joshua Wierenga, Aaron (Rachel) Wierenga, Lexie (Derrick) Kroodsma, Whitney Wierenga; great grandchildren, Zoey, Alina, Eloise, Micah, Ruth, Marie, Adelaide, Genevieve, and Sydney. A memorial service will be held at 11 am on Saturday, March 23, at Trinity United Reformed Church, 7350 Kalamazoo Ave., SE, with Rev. Brian Vos officiating. Interment was in Chapel Hill Memorial Gardens. Contributions in memory of Lucille may be made to Trinity United Reformed Church "RMS".